Snooper My-Speed DVR - A drivers ultimate co-pilot!! With a 5" screen, built-in 1080p Full HD Dash Cam the My-Speed DVR displays and alerts you to speed limits and changes in speed limits throughout Western Europe! 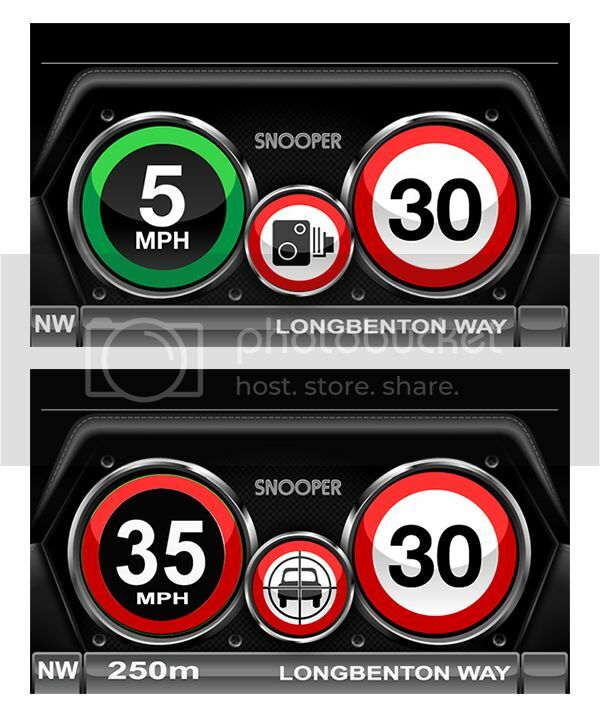 Plus, incorporates Snooper's Award winning GPS speed trap detection technology supplied by AURA(TM). With FREE speed camera updates. The My-Speed DVR software will display the speed limit of the road you're travelling, plus your current speed in large format. This aids drivers to quickly see the speed limit and their current speed, protecting their driving licence and keeping them free from hefty fines. The watchfull eye of the built-in dash cam will be continuously recording and storing any events that happen whilst on your journey. New Snooper My-Speed DVR has been launched as Snooper's very latest driver aid to stand alongside the current range which includes; My-Speed XL, 4Zero Elite BT, iRadar, DVR-4HD, DVR-5HD and My-Speed Connect. My-Speed DVR comes with a full high definition dash cam. Snooper's latest unit automatically records and saves any vehicle incidents you may encounter negotiating the UK or Europe's vast road network. Ideal video evidence for any insurance claim. *Sat nav shown above is an optional upgrade. Have you ever been driving along, confused as to what the speed limit is, unsure whether you are in a 30mph or a 40mph zone? You frantically scan the side of the road as you drive but can't see a speed limit sign anywhere? My-Speed DVR has the answer! Inappropriate speed is often responsible for many road accidents resulting in serious injuries which sometimes can even be fatal. My-Speed DVR will ensure that you know what the speed limit is on every road you travel on so you can drive safely at all times. Using the very latest GPS technology and the most comprehensive database of speed limits in Europe provided by Here® they will also supply FREE LIFETIME speed limit updates, this amazing device will alert you continually to the speed limit of the road you are travelling on. If the speed limit changes on the road you are travelling on, My-Speed DVR can be set to alert you both visually and audibly so you never find yourself inadvertently driving at the wrong speed. Snooper My-Speed DVR will alert you the moment you exceed the speed limit. Two different attention grabbing displays are shown depending on whether you are driving above or below the speed limit. or confident reversing in difficult situations, My-Speed DVR can be linked up to your reversing camera and displayed on the 5" screen for easier manoeuvring. Purchase a Snooper reversing camera today and reduce the risk of an accident. My-Speed DVR is mounted on to the inside of your vehicles windscreen with the windscreen bracket provided and powers from the cigarette lighter socket. In addition you can set My-Speed DVR to alert you to any other speed limit you choose. Set My-Speed DVR to alert you visually and audibly to any speed from 20-150mph. My-Speed DVR could be the most important driving aid you ever buy! The built-in 1080p Full HD Dash camera will constantly record and when its G-Sensor is triggered the event footage will be saved for use in determining exactly what happened, when & where! Snooper GPS speed trap detection technology! Provides advanced warning of police traps across Europe. In addition to alerting you to changes to speed limits, My-Speed DVR also incorporates Snooper's award winning GPS speed trap detection technology. My-Speed DVR uses AURA(TM), the most comprehensive speed trap database available with Worldwide cover. The AURA(TM) advantage - not all speed trap databases are created equal! Only Snooper speed camera detectors utilise our unique AURA(TM) database. All GPS location systems are only as good as the information that is stored inside them, therefore it is essential that your system uses the best there is. AURA(TM) was created to provide the very best automotive Speed Trap database available. New Snooper My-Speed DVR is different to other non-Snooper systems because the AURA(TM) database allows you to download live updates 24 hours a day, every day. Cheaper, lower quality systems usually only give you the opportunity to download a database 4 times a year. This means that your system can be up to three months out of date before your next update. If you get caught out by a new speed camera you didn't know about, you'll have no-where to turn. The AURA database contains all information that is vital to today´s driver. The vast database now comprises the widest number of locations imaginable including: Gatso, MCS, Truvelo, Watchman, DS-2, Speedcurb, SPECs Average Speed Cameras, Mobile Laser sites, Mobile Camera Vans, Mobile Gatso and Truvelo Cameras, Accident Hotspots, High Risk Zones, Digital Cameras, Congestion Charge Cameras and Schools (optional). Plus the database includes the Speed Limits at all these locations so your Snooper My-Speed DVR can count down accurately to the hazard! As well as the UK and Ireland, the AURA speed trap database now offers Worldwide protection. Germany, Holland, Belgium, France, Spain, Portugal, Switzerland, Italy, Austria, Luxembourg, Denmark, Norway, Sweden, Finland, Poland, Romania, Russia, North America, Canada, Australia*, New Zealand* and South Africa and is still growing. So from Manchester to Monaco you will always be protected by My-Speed DVR! Includes FREE speed camera updates! To ensure that My-Speed DVR is kept up to date customers will have the opportunity to update the speed limit information stored on their device once a year. Details on how to subscribe to this service are included with the My-Speed DVR. My-Speed DVR - For better drivers. This unit has been designed to provide safety information but it not a substitute for driving with due care and attention. The driver is responsible for paying full attention to road signs, road conditions and the proper operation of the vehicle at all times. Always defer to all posted road signs and road conditions.